I started a new diet bet. Only this time at work. We follow the same rules as the online Dietbet just no submitting photos in our underwear. They don’t allow that kind of stuff at work you know. So, in our group we decided a weekly healthy potluck would be a great motivator and a chance to get together and share recipes, success and failures. Hopefully not failures. Although cheesecake isn’t your typical “diet” food. I thought it would be a great time to try this recipe from Katie Lee. I had ripped it out of SELF magazine a few months ago and tucked it away. I made this delicious, guilt-free cheesecake last night to bring in for our luncheon. At 239 calories per serving, 8 g fat (4 g saturated), 33 g carbs, 1 g fiber and 12 g protein, this was something I thought I could share without sabotaging my fellow dieters. I must say, one of my favorite parts of a cheesecake is the thick, buttery graham cracker crust and this does not have one. It is more like a light dusting of fine crumbs along the sides with a bit heavier layer on the bottom. So I did kind of miss that a little. But I would absolutely make this again. 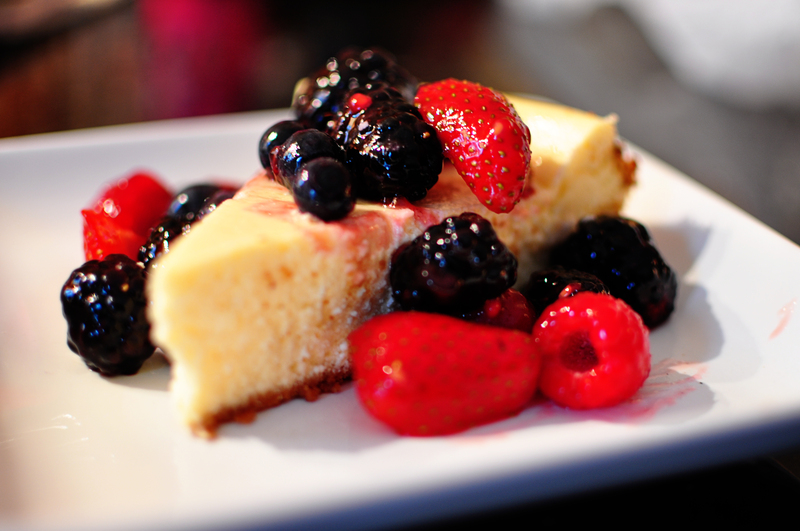 I thought it was a wonderfully delicious alternative to a traditional, heavier cheesecake. It was creamy, light and lemony and the texture was just like “real” cheesecake. I did add 1 tablespoon of melted seedless rasberry jam to the fruit to give it a nice sweetness and shine. The fruit on top was fresh and sweet and was a nice contrast to the slightly tart lemon. Let’s not forget incredibly easy to prepare. This would be a perfect addition to an Easter dessert table. Heat oven to 375°. Spritz an 8″ round springform pan with cooking spray. Using the bottom of a measuring cup, gently press graham cracker crumbs into bottom and sides of pan to form a crust. Coat with cooking spray. In a blender or food processor, mix cream cheese, cottage cheese, eggs, sugar, lemon juice, flour, zest and vanilla extract until smooth, 45 seconds. Gently pour into pan. Bake until it looks set but has a slight jiggle, 40 minutes. Let cool in pan 20 minutes. Refrigerate at least 2 hours with a towel or oven mitt underneath. Mix berries with melted jam (if desired) and top with berries to serve. Love that you made this lighter – and it doesn’t even look like it! Gorgeous!! Thanks! It got rave reviews at my diet group!